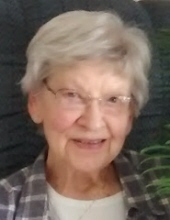 Katherine M. Hausner age 97 of Dodgeville and formerly of Spring Green passed away unexpectedly on Thursday, November 22, 2018 at her residence. She was born on April 17, 1921 in Plain, WI the daughter of Joseph and Catherine (Alt) Blau. Katherine was married on February 27, 1946 to Anthony “Tony” Hausner. She was a member of St. John’s Catholic Church in Spring Green, was an extremely good cook, enjoyed gardening and was instrumental in starting up the Spring Green Senior Center. Katherine made friends where ever she went and was loved by many. She farmed in partnership with her husband Tony all of their working years and in retirement painted and varnished many of Tony’s woodworking projects. Survivors include her 2 daughters, Donna Atwood-Dowling (Charlie) of Phoenix, MD, Joanie (Duane) Cook of Dodgeville, 4 grandchildren, 5 great grandchildren, a sister, Margaret Reeson of Dodgeville, many nieces, nephews, other relatives and friends. She was preceded in death by her parents, Joseph and Catherine Blau, her husband, Tony Hausner, a granddaughter, Rachel Atwood, 7 siblings, Cecilia Beolow, Elizabeth Zins, Edward Blau, Marion Layton, Daniel Blau, Sr. Rita Blau and Gerald Blau. A Mass of Christian Burial will be held on Thursday, November 29, 2018 at 11:30 A.M. at St. John’s Catholic Church in Spring Green. Fr. John Silva will officiate with burial in the St. Luke’s Catholic Cemetery in Plain. Visitation will be held on Thursday at St. John’s Catholic Church from 10:00 A.M. until the time of Mass. Online condolences available at www.staffordfuneralhomes.com. The Richardson-Stafford Funeral Home is assisting the family with the arrangements. "Email Address" would like to share the life celebration of Katherine M. Hausner. Click on the "link" to go to share a favorite memory or leave a condolence message for the family.